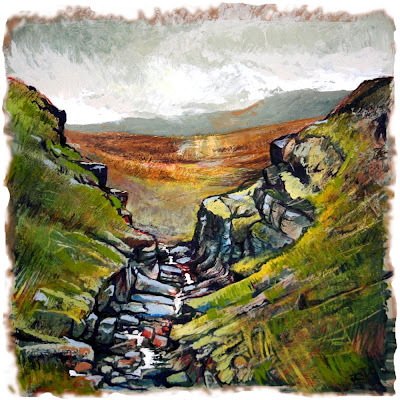 the wild studio experience - in the early spring of 2010, I made a shelter for observing, drawing and making artwork, high up on the fellside behind my North Pennines home in England's north. Since that time I've tried exploring other landscapes with a similar immersion in their environments. This (b)log describes my progress and some other works. 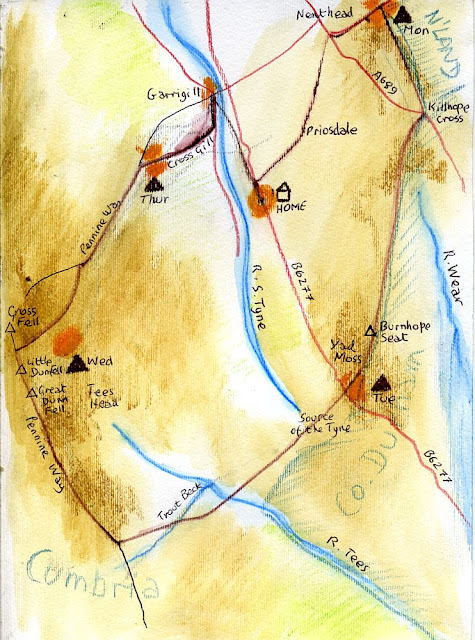 At the Summer Solstice 2012, from Monday 18 June to Friday 22 June, for five days and four nights I shall walk a circular route that follows the watersheds of the rivers Wear, South Tyne and Tees, and visiting the source of each. It will be more of a wander than a walk. I shall be stopping frequently to observe closely and make images of what I see and experience. I plan to spend one third of my time walking, one third observing and image-making, and one third resting and sleeping. DAY 1: Home (High Ashgill) - Black Hill (Northumberland border on the Carrshields road) via Priorsdale and Nenthead Mines. DAY 2: Killhope Cross - Crookburn Bridge (Co Durham border) on the Middleton-in-Teesdale road) via Nag's Head and Burnhope Seat. DAY 3: Yad Moss - Tees Head via Source of the Tyne, Moorhouse Nature Reserve, Trout Beck, Great and Little Dun Fell. When I return,. I shall use the images that I will have collected to work into paintings, panels and prints. The paintings and panels will form the basis of an exhibition. The prints will be available for people to buy at £20 each, or £100 for the complete series of six. They will be printed on quality paper with archival quality inks, numbered, unmounted and unframed, and limited to no more than 100 each. All of the profit from these will go towards the funds for the repair of Garrigill Village Hall. The exhibition pieces will also be for sale, with 30% commission also going towards Garrigill Village Hall. I am inviting people to pre-order the prints for a reduced price of £15 each, or £80 for the complete series of six. To pre-order, please e-mail me - jules@cadie.net. I consider myself to be an artist-explorer. Not an explorer of extreme physical terrains, but nevertheless ever curious about the interface between nature and culture. And not an artist whose concepts are the ends, but the means, of creating work. I'm also an artist-facilitator. This means I'm always attempting to find ways for us humans to have a meaningful relationship with our natural world, so we can learn about sustainability and transition in the future, and how best we can celebrate our own human relationships, individual to individual, community to community, and culture to culture.